Dr. Dan graduated from University of Illinois-Urbana-Champaign Vet School in 1991. After a few months working in another practice in St. Louis he came to Ferguson Animal Hospital to work for Dr. Goman. About a year later in 1993, Dr. Dan and wife Dr. Julie Wentz (also a U of I graduate) purchased the practice. Drs. Dan and Julie were married while still in vet school. Together they have four beautiful daughters, Rebecca, Jessica, Kathryn and Olivia. Rebecca is currently attending University of Missouri-Rolla, and Jessica is attending school in Columbia Missouri. Depending on how long you have known us, you may have seen the older girls grow up, or may have seen Kathryn and Olivia in their scrubs 'helping" daddy around the practice more recently. Dr. Julie sometimes comes in to help out, or just to chat, but is currently working overnight shifts at the Bridgeton Emergency Clinic (Hopefully you haven't had to visit her there.). With their hectic schedules they somehow manage to have time for their 6 cats. Ally is a beautiful 8 year old dilute calico, JJ is a 10 year old long haired blue female, and Toby is a 17 year old medium haired orange and white tabby. Lastly, the three new additions are rescues that Dr. Julie has bottle fed. The three girls, Mimi, Sassy, and Sasha were born in November 2008. When he can get away, Dr. Wentz works with Rep-Cal, a reptile food producer. 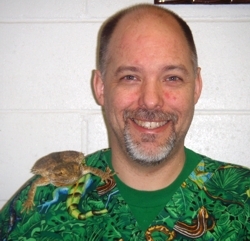 He has helped them develop high quality diets for many different reptiles. He also travels around the country to different reptile shows to distribute Rep-Cal and stay in touch with the reptiles and exotics he loves so much. Dr. Renita Turner (Webster) graduated from Tuskegee University School of Veterinary Medicine in 2002. 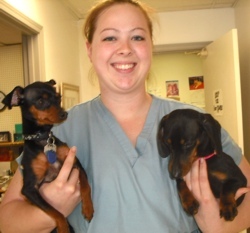 She joined our staff in 2007 as a relief vet but later stayed on as an associate. She will at times fill-in for relief work at other establishments, but calls us home. 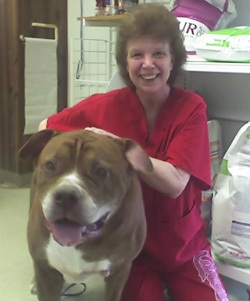 In addition she teaches within an accelerated veterinary technician program at one of the local colleges. Over the years she has been very active in her church including prison ministry, drama ministry, and teaching Sunday School. In 2010, she married her college sweetheart, Demond Webster and soon afterward had her first daughter, Jorja. After the family dog passed away, it was decided to wait until their child was older before getting a new pet. 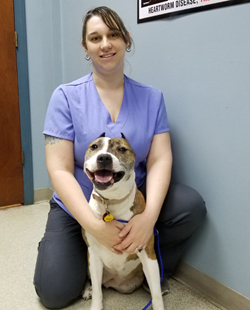 Melisa is the newest member of the Ferguson Animal Hospital family. She has been with us since April 2008. 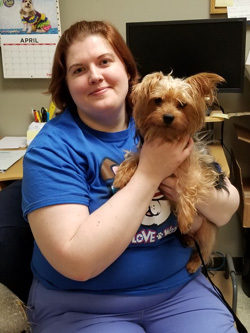 Melisa's credentials include a certificate in veterinary assisting from Midwest Institute in Kirkwood and 4 years as a kennel attendant at Kennelwood Village. In her spare time Melisa is busy preparing for her wedding in June 2009 to Iraq veteran fiancé Casey. She also enjoys softball and playing with her two dogs Spaz (3yr old Miniature Pinscher), and Desi (6 month old Miniature Daschund). 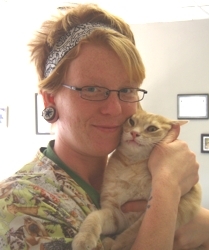 Those who have visited the clinic recently have probably met Desi, who has become one of the clinics greeters! As a receptionist, Meghan is usually one of the first people you meet when coming to the practice. Working with her own animals at home led her to starting her career as a technician 7 years ago at another animal hospital in the area. She came to us in 2004. After a long day at Ferguson Animal Hospital, Meghan goes home to her 3 dogs, 4 cats, 1 bird, and 1 turtle OH MY! Meghan is also the mother of two beautiful children, her 2 year old son Quentin, and 8 month old daughter Sophia. Linda used to be one of our front desk receptionists, but now after 14 years with us, we have begun hiding her in the office behind the scenes. So don't fret we haven't lost her, just changed her hours to allow her to take care of her father who now lives with her and husband Bill. Linda has two sons Tony and Billy and one beautiful granddaughter Abby who is turning 4. She also has two beautiful little dogs. Breezee is a 14 year old gold and white Shih-Tzu, and Stormy is a 16 year old brindle Shih-Tzu. Sadly Linda lost her third Shih-Tzu this past year. Windy was a black and white Shih-Tzu, and she is greatly missed. Another recognizable face is Renee, who has been with us for 12 years as a receptionist. Before working with us, she has held numerous other exciting positions. Dr. Julie Wentz first met Renee when she was working as a technician at the North Emergency Clinic in Bridgeton. In addition she has worked as a Union Carpenter, was a keeper in the antelope and camel barns at the zoo, and dispatched and ran calls for the Humane Society. Her and husband Tony have been married for 26 years and have two boys, Marco 22, and Chad 19. Her current critter crew is Lulu a 1 year old pug, Pancho a 13 year old mixed breed dog, a parakeet and an albino corn snake. Hopefully she will be moving into the new house that she and Tony designed and built themselves. Crystal graduated from Hickey College in 2012. Since then she has worked in a wide array of vet clinics with specialties ranging from zoo medicine, emergency medicine, and avian medicine. She moved here with her husband in 2015. They now live in Alton, IL where they share their house with their son Jace and a variety of furry, feathered, and scaly pets. Rachael went to Midwest Institute and got her certificate there. She worked at another animal hospital before joining our team in January 2017. 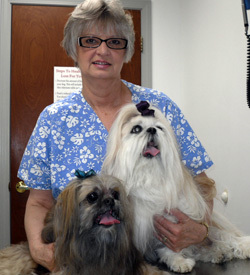 She has been working the the veterinary field since 2005. Currently she has 5 dogs and 1 cat. When she is not working as a technician you might see me in the front as a receptionist.